Thank you for your interest in our company, services and products! CH Four Biogas is an industry leader in the field of anaerobic digestion. We have proven this with our innovative design, well-performing systems, progressive products, and our dedication to research and the furtherance of biogas technology. Anaerobic digestion is our complete focus, and our facilities speak for themselves. all sizes of AD systems from concept to reality. Whether a 100 kW agricultural manure-only digester or a multi-MW multiple-waste-streams industrial facility, CH Four has the experience and expertise to ensure a smooth development and construction experience and reliable system performance for systems in operation. Recognizing the varying needs of our customers, we also offer a full suite of implementation services from Owner-Built to DBFOO (Design, Build, Finance, Own and Operate), as well as complementary services (such as feedstock sourcing and project financing) through our trusted partner companies. We look forward to working with you on your digester project. 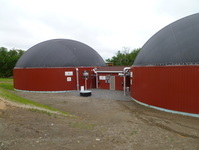 CH Four Biogas specializes in the design, installation and optimization of anaerobic digestion systems for the agricultural, industrial and municipal sectors throughout North and South America – Construction Management every step of the way! CH Four Biogas will guide you in determining both the technical and economic viability of your proposed project. Our ﻿Digester Site Assessment Form﻿ will help initiate the feasibility study process. The form can be completed digitally, or can be printed and faxed. Or simply call and we'll work with you to obtain the information. Click here to learn more about our feasibility process. © CH Four Biogas Inc.